I don't know why I got up at 5:45 this morning. It's a holiday. But something is screaming to be written so I just have to follow the creative flow and see where it leads me. I know I should be writing about my SNS Challenger photo trip experience already after having uploaded about 100 photographs this entire weekend. But there are some things that I would just like to keep looking at even before I do conclude what I felt about the whole trip. However, that might take too long and I figured, since this blog is about recording my creative processes anyway, I might as babble myself into enlightenment right here. First of all, I have never been part of any photo project similar to what Gary McLeod has conceived with SNS Challenger. I had a lot of fun especially trying to decode the locations of the photographs and allowing myself to capture my response to the experience by pushing the limits of my creative thoughts through a series of other photographs from the trip. I don't think I have captured enough as the approach I took wasn't too conceptual in my composition but more journalistic. I am still happy, however, that at the very least I am able to hold a camera again. We left Alabang at 7:30. Got take-out McDonald's and drove an easy rhythm down SLEX. I felt this quite excitement during the whole ride while we were trying to figure out what route to take. What angles to approach the shot. Who we could possibly talk to, to find more information about what we were taking. When we hit Roxas Boulevard and I saw the strip of Manila Bay something felt liberated inside me. Like a long exhale it washed inside my chest and I was determined that nothing will ruin this trip. No work issue. No relationship issue. No family issue. True enough my thoughts remained focused as I kept in close touch with Adi and Katrise who were our watch towers during the whole time. Gary had suggested that since they weren't able to go with us "on foot" they can try to follow and document our journey through GPS which I think Adi was able to perfectly capture. 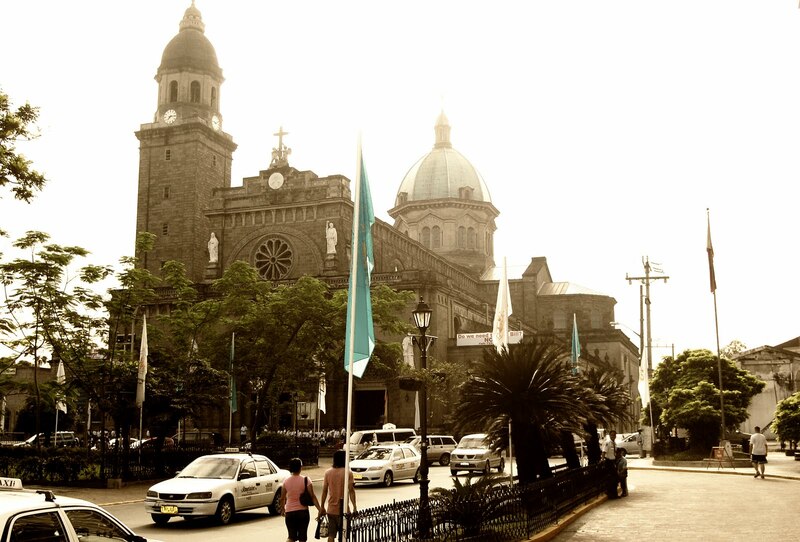 Seeing Intramuros again brought a whole rush of memories. The first time I went back to the walled city after ages was when I took Adi there 2 years ago. Her photos of the place where amazing and just taking photographs with another person who was seeing the place for the first time allowed me to experience everything through the eyes of discovery. When we got there the weather was perfect. The breeze was cool and the morning light was a muted orange. Tourists were just starting to pour in and the facade of the Cathedral was majestic against the peeking morning sun. Our first stop was Binondo and as we have agreed we will take a cab going there because we weren't familiar with the place. The cab driver was a character. He noticed our cameras right away and asked if we were photographers. We said we were doing this for a project and we lived down south, hence our unfamiliarity with the district. 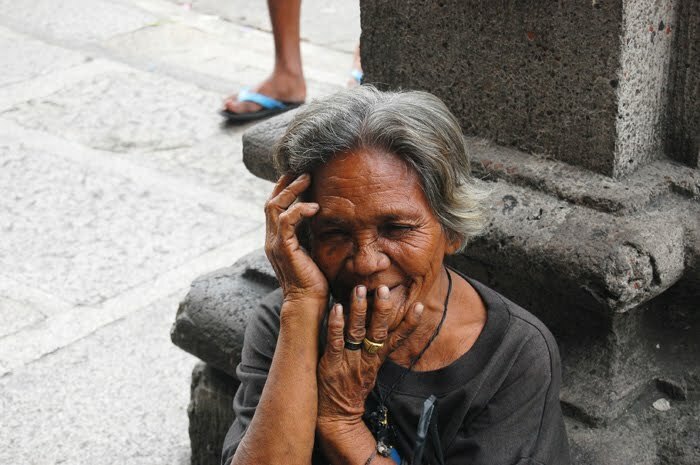 He laughed cheerfully and said that he has been driving down the roads of Old Manila for 30 years. He also said that he was a photographer and did it part time as extra income. I felt quite safe already since initially I was feeling a little bit apprehensive traveling unknown streets. 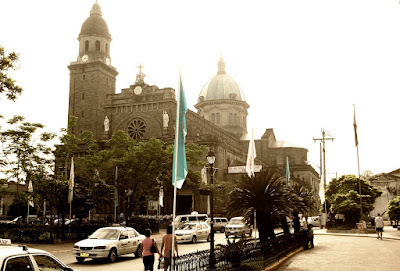 We got to Binondo church earlier than I expected and I immediately felt the history in the area of its crowded streets. China Town was bustling that early. Shops were already open and a lot of people walked the sidewalks talking in Chinese. I told myself that I shouldn't feel too alien since I'm sure I don't stand out. The photos above are the recreated photos we were supposed to take from the 19th century HMS Challenger files. 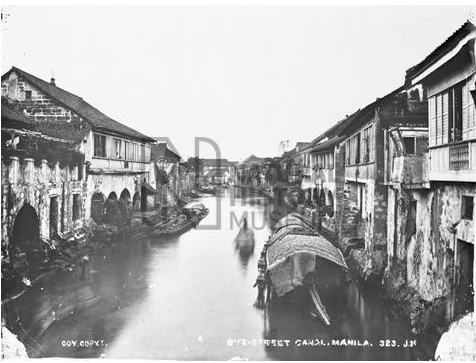 These were of Binondo Church and a Street Canal. It has to be pointed out that finding the location of San Fernando Canal was quite a big surprise that it took me 15 minutes before I was able to make sense of what had just happened. From the entrance of the church we walked to bridge railing to find the angle of the 19th century photo above. We first stood at the left side (the side facing the church) and then moved to the right but realized we couldn't capture the angle from the right because a tree was blocking our view. While surmising the area we realized that we were standing on a bridge above a canal. We had plotted about 7 canals on our map to visit just to find photo 443 labeled "Bye Street Canal". It took about 5 minutes to realize that the canal we were looking at while in San Fernando Bridge was the canal we were looking for because of the very significant bend to the left. We had studied this bend for a whole week and a half and staring at it right infront of us was a memorable eureka moment. I fail miserably at describing this moment right now but one of these days I'll probably have to just recreate the conversation. 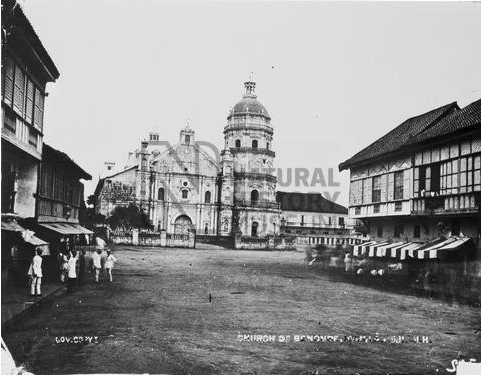 Another big surprising discovery was realizing that the houses to the left, facing the church, are the same exact houses on the 19th century photo. We counted the windows. The angles. And there was another moment of crawling goosebumps on our skins. 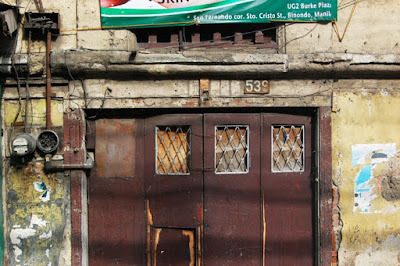 The Binondo discoveries blew my mind away because I didn't realize that getting to know a place through 19th century pictures would give me this experience that was part "getting to know the place for the first time in present day" and "getting to know the place through 19th century photographs". The experience was intimate because I felt like I knew it already and here I was standing in the exact place on present day and seeing all the changes that it has gone through brought a weird sense of nostalgia. When I looked through the windows of the house a little bit more closely I felt a sense of reverie. 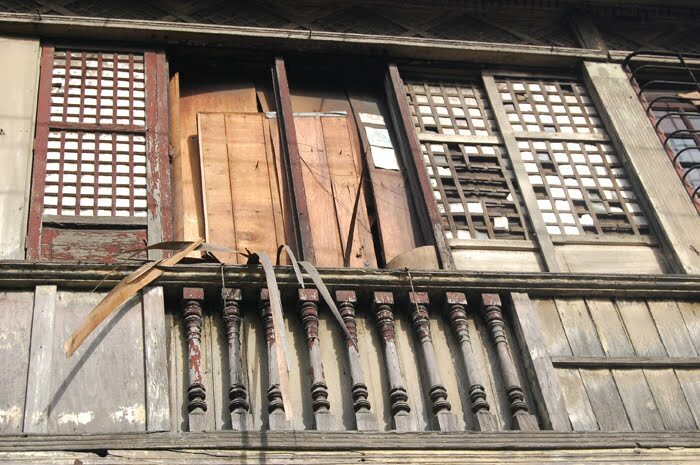 I wondered about the people who lived there and how they would peer out the windows on a lazy afternoon probably in their Maria Clara or Camisa de Tsino. I wondered about the passerbys that would cross the canal and look up at them and call out their names. The windows are all broken and rusty now and it stung to see the dilapidation of the place. So I took pictures of the windows as a way of cradling its memory and acknowledging that they have once contributed to the glory that was Binondo. This was the first stop of our trip and immediately after gazing at the windows I was drawn to the people on the streets. The change I had seen through the photographs and standing there myself led me to ask if there was anyone that felt left behind by the modernization of these parts of historic Manila. Immediately my eyes fell on the ragged clothes of people surrounding the church and the park infront of the church. Their faces gaunt and frail. I had wanted to do something to reach out but was only able to see distinct reactions from two people. The vagabond and the old bag lady. Gary had commented about this picture that I did not realize I depicted. I very much look at the contrast in feet. Strong diagonal really appears to divide class as well as the picture space. How interesting you too note of that because I was supposed to crop this photo but I didn't want the lady to just be there "in isolation". I wanted to show that she was part of the entire thing. The entire thing being what goes on outside Binondo Church. People passing by her. People taking note of her but not giving her anything. People giving her something. The expression on her face when we gave her 40 pesos ($1) was priceless. In this photo she was getting mad at the church janitor because she wanted to collect the candle holders that were being thrown away. She rushed to pick them up and frantically said "Akin yan! Akin yan!" (That's mine! That's mine!). The next photo is of the vagabond (as I would call her). She stood out sitting in the park. I was drawn to her shaved head and I wondered to myself why I knew she was female. Gary: Again, the more I look at this, the more I see contrast. The slight suggestion of eating with the man in orange really heightens the expression on her face. Eleanor: Part of what makes this such a great picture is the very disjointed way in which the bystanders are treated. 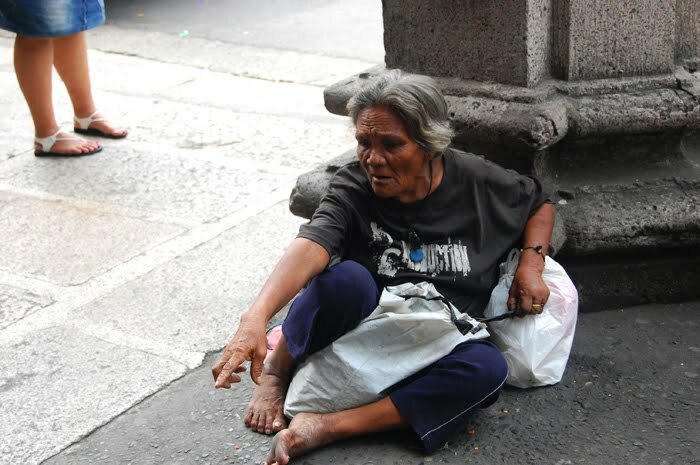 This picture tells me a story of poverty and isolation - and the fact that the others in the picture are incomplete suggests her lack of relationship. All this interaction with my photos has led me to start noticing that I chose a less vibrant setting for my camera. I didn't want too much of saturation because it would draw the attention to the colors instead of the details of the people and surroundings. I felt like the colors would draw a viewer away from the story being expressed in these faces of these people. I realized that I used to take with a more vivid color setting because I wasn't too confident with what I composed with my viewfinder. However, last Saturday I knew I was taking pictures for a different reason. It wasn't so much to beautify or make it known. But it was really more about discovering the place and discovering myself, how I responded to the place. 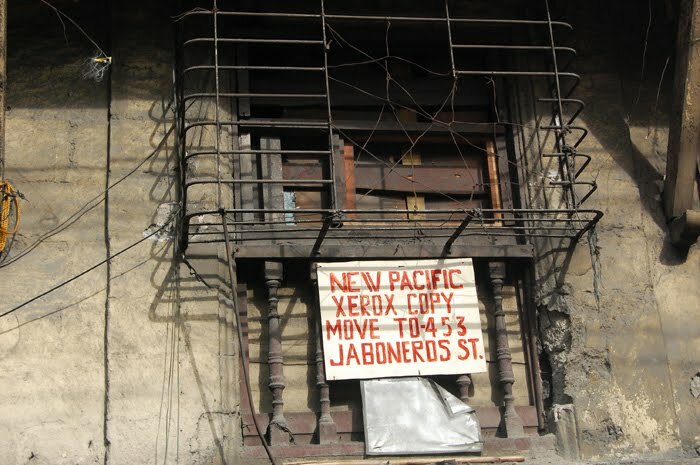 My experience of taking photos in Binondo culminates in realizing that change does go by very fast. Some of these changes are good (cars, easier transport, new businesses, modern buildings). But some aren't (water pollution, poverty, environmental decay). What is striking is that most people think they are good and yet if they are all indeed good why do some things and people get left behind? It is haunting to think about those who have been left behind by modernization. Perhaps I would be consoled if they were "left behind in good hands" and not in poverty. And it begs me to wonder, so I have seen, and now what do I do about it? What a unique project, and what a wonderfully descriptive, first-hand account you've provided of it. Oh, thank you Rachel. :) It's one of the things I'm happy to be doing right now.